In all cultural traditions, food is only one aspect but yet it is probably one of the most persistent. There is no cultural group and no individual for whom at least one specific food – the memory, taste, or smell of which – does not evoke a pang of loving nostalgia. Food plays an inextricable role in our daily lives. Without food we cannot survive. But food is much more than a tool of survival. Food is a source of pleasure, comfort and security. Food is also a symbol of hospitality, social status, and religious significance. What we select to eat, how we prepare it, serve it, and even how we eat it are all factors profoundly touched by our individual cultural inheritance. Peoples of differing cultures inhibit most countries of the world. The human habit of migrating is as old as the history of humans. It is accepted that people move from place to place for reasons of religious or political freedom, for personal and family security, for a sense of adventure. What is often overlooked is something more basic; many peoples of the world have migrated to find food. Historically, this has frequently resulted in the necessity of relinquishing customary tastes according to what foods, seasonings, and even cooking methods are available to them in the new location. 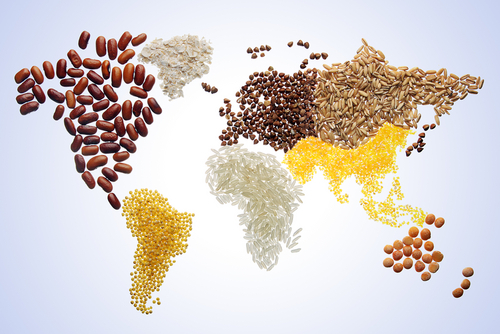 Finding new foods and new sources of foods and seasonings also motivated many adventurers and explorers and swelled the economy of countries. Because of the centrality of food in our lives, many cults and religions impose feast days and fast days, and may list acceptable and prohibited foods. Special occasions, from funerals to weddings, from festivals and fairs to political holidays and religious celebrations – all of these would diminish in pleasure and importance if food were not a consideration. Various foods are given symbolic and even transformative connotations, and there is still no shortage of publications promising that a “magic food” will alleviate pain, increase sexual function, and promise almost everything but life after death. The ability to control one’s appetite, in many aspects of life, but especially regarding food, may also be indicative of social status, and more recently is seen as critical for health and longevity. Even a cursory glance at diets around the world reveals the strange fact that people do not only eat what is available, they eat only what they consider to be edible. What is considered a delicacy in one area and by one group may be considered an abomination by others. Sheep’s brain and eyeballs, frog’s legs, hot tea with fermented yak butter, or animal blood are not considered to be universal foods – nor are insects, but they are relished by some people. Further, eating foods with one’s fingers may be considered ill mannered by some, while others may consider eating with a knife and fork barbaric. Increasingly, awareness of the food traditions, and indeed the incredible variety of herbs and spices, fruits and vegetables, the countless enticing ways of food preparation and food service have enriched our individual food horizons and expanded our views of what constitutes a healthy diet. After all, healthy survival is not the possession of any one group. Increasingly, too, it is becoming obvious that an understanding of many aspects of the cultures of others, including their food traditions, is indispensable in any human communication. This is true not only for professionals in the fields of education, medicine, social work, public health and nutrition, commercial food services, but is clearly recognized today in the global marketplace.